Emergency services at the scene of the crash. 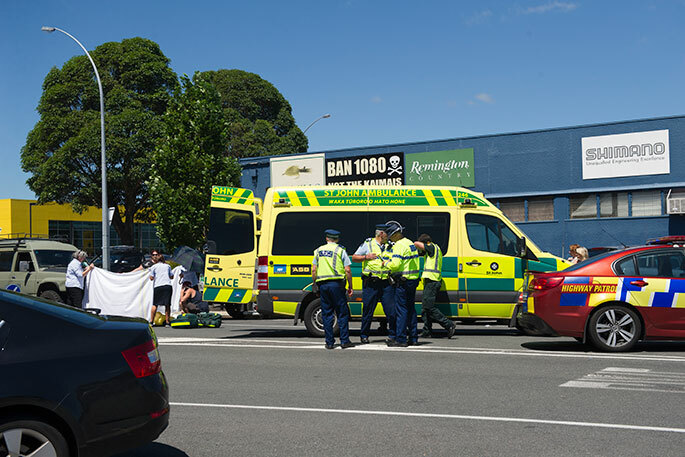 Police have released the name of the elderly woman killed in a crash in Tauranga on Thursday. She was 90-year-old Molly Heapy of Tauranga. "The crash occurred on Ninth Avenue between Cameron Road and St John Street and involved a vehicle and a mobility scooter," says a statement from police released this evening. "The Serious Crash Unit investigation into the circumstances surrounding the crash is ongoing. "Police offer their sympathies to the friends and family of Molly at this sad time." Deepest sympathy to the family at this sad time. We too wonder if this is the same person we have seen crossing the road without pausing at the Ninth Avenue roundabout.